Please visit this page for updated information on the Language Pack Downloader tool. I came across an article this morning that lets you Download ALL SharePoint 2010 Language Packs using PowerShell. It occured to me that it would be interesting to extend this even further and have a windows app to download these language packs instead of going to the Microsoft’s site. One thing that bugs me when I need to download language packs is that I can’t read the interface when the language is switched. I always have to guess where the download button is located. I came up with a desktop application that presents the user with a simple interface to download the language packs. Here is another view as a download is progressing. 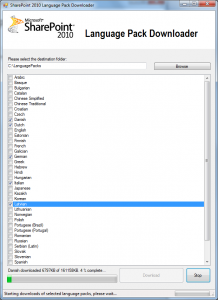 The application has been updated here and on codeplex to address a small issue when downloading a single language pack. I only mention this because I’m not able to download some of the languages (the language pack does not exist) using your tool and when I could download some, I get an error trying to install them (RussianLangaugePack_SP1.exe is not a valid Win32 application). This actually worked on my local machine, please ignore my previous post. Are there any prerequisites need to run this tool? To run the tool there should be no extra requirements other than .Net 3.5 runtimes available on your workstation. You will however need to install the language packs with the proper version of SharePoint, and only on a SharePoint server. Thanks for using my tool. If you see anything that could be improved, let me know. As for the download url, the block of code there tries to build the url in a specific format then looks at the result to see if the page is valid and has a download. It falls back to another url format if the specific language is in the old page style. As per my last tests, back on June 6th, all the language packs downloaded properly. If you do see some failing downloads, let me know and I can look into it. You have options for Service Pack 1 for SP 2010, will you enhance this tool by also including SP2? Thanks, this is an awesome tool and time saver, now if there was a quicker way to streamline these language pack installs I would be cruising. Hi Frank, thanks for the request. I will definitely add it to the tool. I’ll let you know when it is ready. Hi Frank, I have just updated the Codeplex project with your requested change. Let me know if you have any trouble. Awesome, I will give it a try. Can you add 2013 foundation as an option? Thanks!